Volcanic ash clouds and volcanologists trying to get to Australia! the world one and a half times. My next few weeks of travel, as well as those of tens of thousands around the world trying to get to and from Australia are going to be interesting! I'm scheduled to go to the joint meeting of the International Union of Geodesy and Geophysics (IUGG) and the International Association of Volcanology and Chemistry of the Earth's Interior (IAVCEI). The reason? The on-going eruption of Puyehue-Cordon Caulle volcano in Chile. The ash from this volcano has travelled across the southern Atlantic Oceans, under Africa and on to the Indian Ocean, impacting Australia and New Zealand along the way. 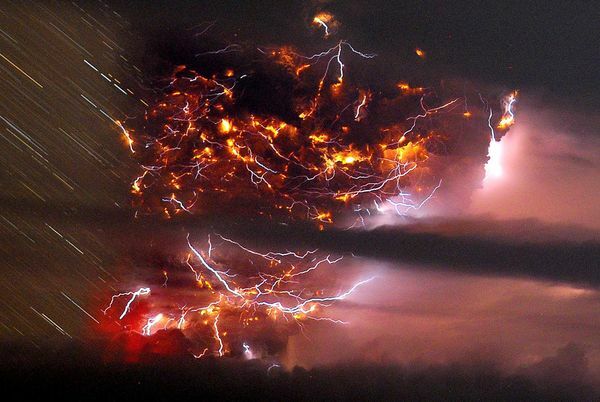 A lot of volcanologists, who normally love volcanic eruptions, are going to be tic'd off at this one! Especially our colleague, Ray Cas, who is the Chairman of the joint Australia and New Zealand Organising (yes, that's spelled correctly--it's Aussie) Committee!! The ash would not have normally come near Australia, according to Andrew Tupper, head of the Volcanic Ash Advisory Center. However, the jet stream brought a low pressure system that grabbed some of the ash cloud. Tupper is optimistic that it will clear out in a day or two. Tupper says that "The low pressure system, although it is annoying, does have the beneficial effect that it's helping to break up the cloud itself, perhaps stopping it from coming around (over Australia) a third time." The ash has now gone around the world one and a half times. Martis Creek Dam is in Nevada County, California, about 6 kilometers east of Truckee, about 56 km upstream from Reno. 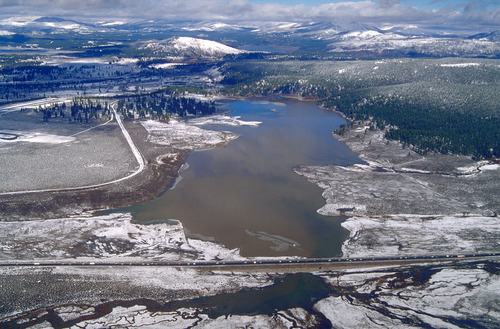 The lake is next to the Truckee-Tahoe Airport (runway in left of photo). The highway in the foreground is California State Route 267. This winter scene shows the lake in winter when it is fairly full. This dam is one of 10 dams in the U.S. that has been judged to have "urgent and compelling" safety concerns according to the U.S. Army Corps of Engineers. The dam, which was completed in 1972, has significant leakage and was believed to lie close to two fault zones. If the dam fails, potentially parts of Reno could be flooded. The plot has now thickened: this month, Hunter et al. reported in the Bulletin of the Seismological Society of America that Lidar work there revealed a new fault, now named the Polaris fault. It's 35 km long and has the potential to generate a magnitude 6.4-6.9 earthquake. It exhibits "youthful and laterally continuous tectonic geomorphic features" along its full length. It represents a significant seismic hazard to the greater Truckee-Lake Tahoe-Reno-Carson City area. Reference: Hunter et al., LiDAR-Assisted Identification of an Active Fault near Truckee, California, Buletin of the Seismological Society of America, vol. 101 (3), p. 1162-1182, June 2011. 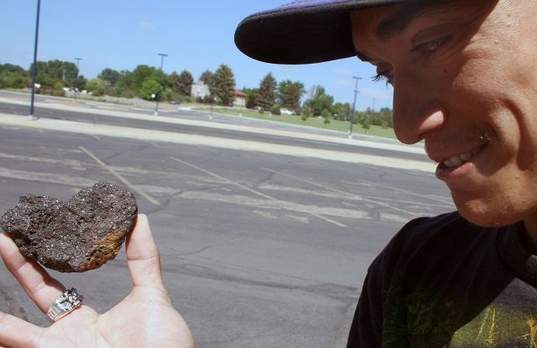 Carlos Martiez and his meteorite found on Memorial Day. The Greeley Tribune reported on Sunday that Carlos Martinez a bull-snake led Carlos Martinez to a special rock--a 4" iron meteorite shaped like a heart! He noticed his neighbors watching something in front of his house, and went out to see that a 5'-long bull snake was slithering out of his bushes. When he looked back into his yard, he noticed the meteorite lying in a small crater in his yard. University of Northern Colorado professor Bob Brunswig confirmed that the rock was a meteorite. A bit of terminology: A meteoroid is a pice of rock or ice moving through space, the term generally applied to objects smaller than asteroids. A meteor is a meteoroid that has entered the earth's atmosphere, a shooting star. Most meteors smaller than a pea will burn up in the atmosphere due to friction with the atmosphere as the fall. A meteorite is a meteor that survives its descent. Typical velocities of encounter with the earth are 11 km/second for objects that come in from the asteroid belt, and 51 km/second for comets. It is likely that this small heart-shaped meteorite broke off a larger body that was entering the atmosphere and was slowed way down by friction with the atmosphere. Still, Carlos is lucky that it landed in his lawn and not in his house! 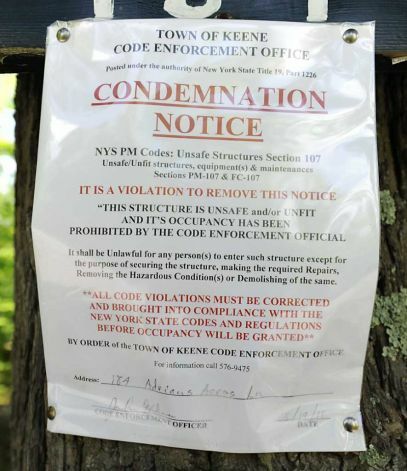 The chances of a meteorite hitting a house are small, but it has happened. In 2003 hundreds of fragments of a meteorite fell in the Park Forest area of Chicago, several fell through roofs of houses and one through the roof of a fire station. In the same year, a 20 kg (~44 pound) stone meteorite crashed through a two-story house in New Orleans, landing in the basement. Poor Mrs. Hodges, asleep on a couch, was hit on the hip by a 10 pound stone meteorite in 1954...and lived to tell about it! For those who would like to learn about the types of meteorites, here's a primer. I try to keep this column from being a political forum, but I would like to point out the perspective of today's big announcement that "ExxonMObile strikes oil in Gulf of Mexico." In case you don't read to the end--yes, it could yield 700 million barrels, "yes, it could power the U.S. for 28 days, based on the daily consumption of 25 million barrels." The world uses about 72 million barrels of crude oil per day, so it's enough to power the world for 10 days. It will take a couple of years to be drilled, collected, refined and sold to consumers according to this source. Is anyone out there asking if this is a wise course of action, to spend years of resources to develop a supply that is literally providing a few days of relief to our energy problems? There is an excellent collection of photos in this article. 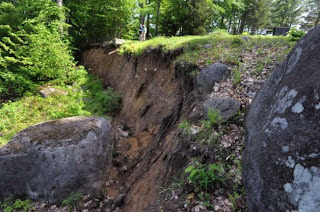 A record landslide started in New York state on May 6 in the hamlet of Keene Valley on Porter Mountain, a mountain pockmarked with scars of prehistoric landslides. In a wonderful understatement about the power of gravity, associate state geologist and director of the state Geologic Mapping Program, Andrew Kozlowski said "We are talking about hundreds of thousands of tons and it is all moving, gravity has taken over." As of May 28, an 82 acre patch had slid 20 feet down the mountain, and was sliding a few inches a day. Spring melt from a heavy snowpack and heavy spring rains (9-12 inches in early May) had saturated the ground, triggering the slide. The ground on the mountain is composed of sand and glacial till. It had been hoped that the spring blossoming of the trees would draw enough water out of the ground to slow or stop the slide. Unfortunately, that has not been the case. The movement stopped for a few days, but then picked up at an increasing rate and is now moving up to a foot a day. Residents are trying to move their homes, but insurance does not cover landslides in this area, the cost is ~$100,000, and time is running out. One couple reports 15 feet of open air between their bedroom and the ground below (see article link in figure above). As of today, the TimesUnion reports that the scarp at the head of the landslide is eight tenths of a mile long and that the slide continues about a half-mile down the mountain. The vertical drop between the scarp and the toe is 300 feet. Kozlowski says that LIDAR (Light Detection And Ranging) mapping might have revealed landslide risks under the thick forest canopy, but has never been done. 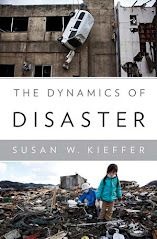 "Missouri levee boil forces evacuations"
I've enjoyed a month's vacation from blogging, but now am getting back the creative urge, so hopefully I can post more regularly on the many interesting events, both local and global, involving fluid mechanics in geology! A sand boil on April 27, 201; along the levee near Hickman, Ky.
CNN is reporting today that a "boil" has caused an evacuation of about 600 people from Hamburg, Iowa. Hmmmm...I hadn't a clue about boiling levees! Turns out that it's a well-known and well-studied phenomenon because it can lead to rapid levee failure. The boil noticed today appears to be a hole less than 1.5" diameter that created a small geyser of water erupting onto the dry side of the levee. A-ha--if they had said "geyser," I'd have gotten the idea much sooner! Black Hawk helicopters are being used to drop sand bags onto the levee because it is deemed to dangerous to send in a ground crew. Here's a primer from the Army Corps of Engineers on levee failure and repair. A "sand boil" from a levee is a small hole created by water seepage through the levee. Water flows through (sometimes being so turbulent that it appears to boil), creating the "geysers" noticed today. Sand boils occur in earthen dams, but the phenomenon is usually referred to as "piping," not boiling. If the seepage water is dirty, it indicates that material is being eroded from the levee and that the integrity of the levee is threatened. If you ever need to sandbag your premises, check out the instructions on the primer sheet! Even shows how to reduce fatigue while filling sandbags! I discussed liquefaction earlier in a post about the Canterbury earthquake, without pointing out that the term "sand boil" is sometimes applied to those features.